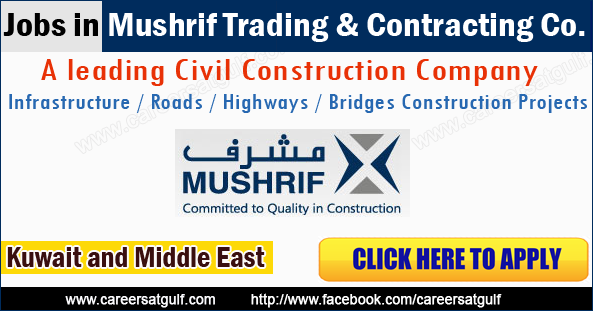 Home Middle East Jobs Now Hiring Mushrif Trading & Contracting Co.
Now Hiring Mushrif Trading & Contracting Co.
A leading Civil Construction Company involved in Infrastructure / Roads / Highways / Bridges Construction Projects in Kuwait. Founded in 1968, Mushrif Trading and Contracting Company KSCP, is one of the leading Civil Construction Companies in the Gulf Region. Mushrif has exceptional Design & Build capabilities in Heavy Civil Works, Major Pipeline Projects, Road Works, Waste Water Treatment Plants, Deep Foundation Works, Buildings and Specialized Construction Services. Mushrif’s track records of quality, safety and reliability have made it a contractor of choice for major developers, government ministries, and private clients throughout the Gulf Region. Mushrif is one of a small number of Construction Companies in the region to receive ISO 9001:2008 certification from BSI (The British Standards Institution). In addition we are classified as Grade 1 for Roads, Sewage, and Building Works with the Central Tenders Committee (CTC), Kuwait Oil Company (KOC) and Kuwait National Petroleum Company (KNPC) in Kuwait and has a specialised classification for work in the U.A.E. with various governmental authorities, which allows it to undertake a wide variety of Civil Construction Projects. CCC Urgently Required to Kazakhstan - Building Projects - Apply Today!